Payments as low as $45/mo. Or, apply & pay as little as $45/mo. 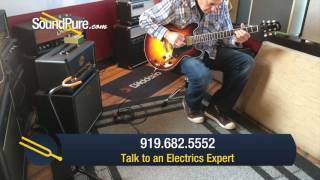 In this video, Sound Pure electric guitar expert Eddie Berman tests out the PRS McCarty 10-Top Birds Tortoise Shell Electric Guitar with a Suhr Badger 18 Amp Head, a Suhr Badger 1X12 Veteran 30 Cabinet, a Jetter Gear David Grissom Signature Overdrive Pedal and a Strymon El Capistan - dTape Delay Effect Pedal. 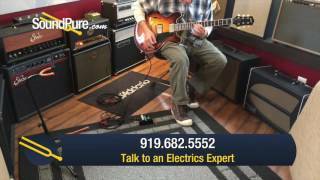 In this video Sound Pure electric guitar expert Eddie Berman tests out the Collings I-35 LC Aged Tobacco Sunburst w/ ThroBaks #16837 with a Suhr Badger 18 Amp Head, a Suhr Badger 1X12 Veteran 30 Cabinet, a Strymon Brigadier dBucket Delay Effect Pedal, and a Vertex Dynamic Distortion Pedal. 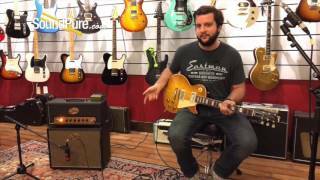 In this video, Sound Pure electric guitar expert Matt Anthony tests out the Gibson Custom Historic Select Murphy Aged '59 Les Paul with a Suhr Badger 18 Amp Head, a Suhr Badger 1X12 Veteran 30 Cabinet, a Strymon Brigadier dBucket Delay Effect Pedal, and an Xact Tone Solutions Imperial Overdrive Pedal. 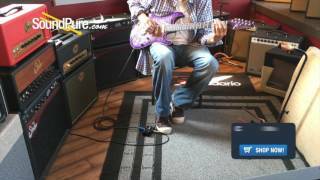 In this video, Sound Pure electric guitar expert Eddie Berman tests out the Collings I-35 LC #16823 with a Suhr Badger 18 Amp Head, a Suhr Badger 1X12 Veteran 30 Cabinet, a Strymon Brigadier dBucket Delay Effect Pedal and an Xact Tone Solutions Imperial Overdrive Guitar Pedal. 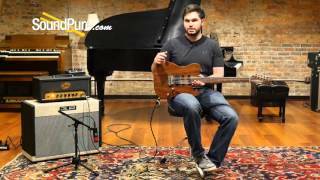 In this video, Sound Pure electric guitar expert Matt Anthony describes and demonstrates the Suhr Classic T Antique 2-Tone Tobacco Burst #JST6V6T with a Suhr Badger 18 Amp Head, a Suhr Badger 1X12 Veteran 30 Cabinet, and a Strymon Brigadier dBucket Delay Effect Pedal. 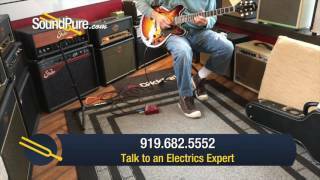 In this video, Sound Pure electric guitar expert Eddie Berman demonstrates the Collings I-35 LC #16830 using a Suhr Badger 18 Amp Head, a Suhr Badger 1X12 Veteran 30 Cabinet, a Strymon Brigadier dBucket Delay Effect Pedal and a Klon KTR Overdrive Pedal. 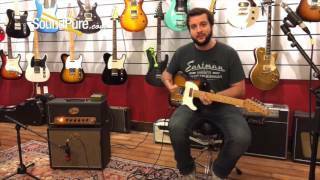 In this video, Sound Pure electric guitar expert Eddie Berman demonstrates the Collings I-35 LC #16823 using a Suhr Badger 18 Amp Head, a Suhr Badger 1X12 Veteran 30 Cabinet, a Strymon Brigadier dBucket Delay Effect Pedal and a Klon KTR Overdrive Pedal. 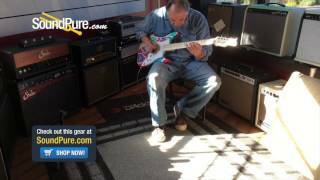 In this video, Sound Pure electric guitar expert Eddie Berman tests out the Tyler Studio Elite Psychedelic Vomit 25th Anniversary #15 of 25 using a Suhr Badger 30 Amp Head, a Suhr Badger 1X12 Veteran 30 Cabinet and a Strymon El Capistan dTape Delay Effect Pedal. 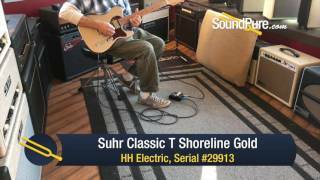 In this video, Sound Pure electric guitar expert Eddie Berman tests out the Suhr Classic T Shoreline Gold HH Electric #29913 using a Suhr Badger 30 Amp Head, a Suhr Badger 1X12 Veteran 30 Cabinet and a Vertex Dynamic Distortion Pedal. 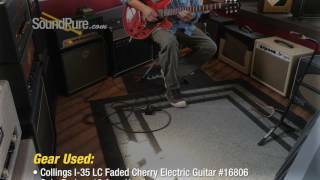 In this video, Sound Pure electric guitar expert Eddie Berman tests out the Collings I-35 LC Faded Cherry electric guitar #16806 using a Suhr Badger 18 amp head, a Suhr Badger 1X12 Veteran 30 cabinet, a Strymon Brigadier dBucket Delay effect pedal and an Xact Tone Solutions Imperial Overdrive guitar pedal. 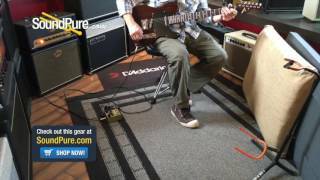 In this video, Sound Pure electric guitar expert Eddie Berman tests out an Anderson Hollow T Classic using a Suhr Badger 18 amp head, a Suhr Badger 1x12 Veteran 30 cabinet, a Strymon Brigadier dBucket Delay Effect Pedal and an Xact Tone Solutions Precision Multi-Drive Guitar Pedal. 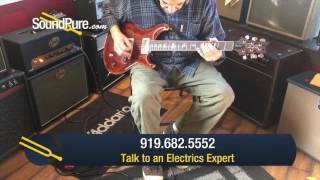 In this video, Sound Pure electric guitar expert Eddie Berman demonstrates an Anderson Drop Top electric with natural purple burst. Other gear used in this video includes a Suhr Badger 18 Amp Head, a Suhr Badger 1X12 Vintage 30 Cabinet, a Strymon El Capistan dTape Delay Effect Pedal, and an Xact Tone Solutions Imperial Overdrive Guitar Pedal. The Suhr Badger 18 Amp Head has its very own tonality with a very broad range of sounds covering a wide spectrum of clean to overdriven tones typically not found in amps of this class. 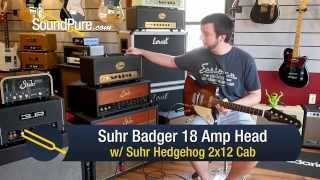 The Suhr Hedgehog is a gorgeous and responsive open-back 2x12 cabinet. With birch ply construction and two Celestion G12-65 speakers, this cabinet allows those bold bass and crystalline treble frequencies to really shine. Both are available for SoundPure’s Try-Before-You-Buy Program, so if you want to hear how they sounds in your studio with your gear, shoot us an email at Electrics@SoundPure.com. 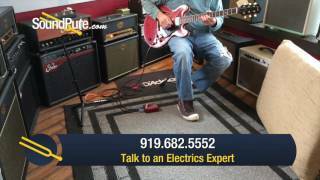 If you like what you hear, you can check out all the gear used in this video at SoundPure.com or give us a call anytime at 919.682.5552. Thanks for watching! In addition to an updated look, the 2017 Badger has a newly designed preamp that features a high-voltage cascaded MOSFET boost and optimized Power Scaling circuit. The Suhr Badger is an innovative amp designed to deliver classic tones at any volume. Badger summons a wide range of british tones ranging from west London to Dartford. From warm complex cleans, to classic British high gain, and everything in between – Badger delivers. Need that same high gain tone at lower volumes? No problem, Badger offers power scaling to easily dial in real power tube crunch all the way down to 1 watt. Driven by a cathode biased power section, Badger delivers a variety of warm, sparkling cleans and rich, dynamic overdrive tones. Whether playing a large stage, small club or your home studio Badger’s Power Scaling feature provides added flexibility. This makes it easy to dial in your ideal tone at any volume – from loud and cranked, all the way down to one watt. The Suhr Badger is a single channel amp that dynamically interacts with your guitar’s volume control and responds to your playing style. The cathode biased power section lends itself to dynamic, spongey tones and requires no bias adjustment when replacing power tubes. POWER: Power Scaling emulates the tonal response of a high wattage amp on 10, at manageable volumes. Power controls the voltage that feeds the output section and in turn, the wattage. As you lower the voltage of the power section you are reducing the amount of signal it can handle before clipping the output section. To compensate for this we use the “Drive” control so you can easily scale down to 1 watt without losing tone & feel. DRIVE: Feeds the input to the power section. With Power at 10 it acts as a master volume. As a rule of thumb, when you turn down the Power always set the Drive control within 2 numbers of the Power setting. If you set the drive lower than the power it will sound brighter, like a “master volume” amp. Amplification has been a love of John's from the early 80's. Surprising to many, John designs, modifies, and builds amplifiers that are amongst the very best and the most highly sought-after in the world – certainly a worthy match for our renowned guitars. It's John's complete understanding of the entire signal chain – from the woods and the metal components in a guitar, to the pickups and their materials and structure, to the design layout of the PC board or PTP construction and the value of each component in an amplifier, to the design of the cabinets and its acoustic properties – that gives Suhr Guitars a distinct advantage in creating the best possible playing experience. Working with some of the top players in the industry from his days in New York, John learned on his own about what makes a great sounding amp. After leaving Rudy's Music Stop in NY, John made the trek to LA and joined forces with Bob Bradshaw of Custom Audio Electronics in 1991 to design and manufacture the 3+ preamp and the OD-100 amplifiers. The OD-100 and the 3+ (later the 3+SE) soon became a standard in the LA studio scene, embraced by top-flight players such as Mike Landau and Steve Lukather as well as many others. John also did extensive amp modification and repair work for various great players such as Eddie Van Halen. John's uncanny ability to envision a great sound that players seek and applying his natural engineering skills to develop great sounding amps for professional use won him a diehard following of some of the best players in the world. Even after John left CAE to work at the Fender Custom Shop, he continued to modify amps on the side and found the time to build the low-power Tweed Twin that Eric Clapton used in the mid-to-late 90's. John's broad and deep knowledge of both the classic American Fender circuits as well as the classic British Marshall circuits is what allowed him to design what many consider the best American-and-British-sounds-in-one-box amplifier in the world: the OD-100. The OD-100 has evolved into several versions to cover a wide array of musical styles and tastes and the basic OD-100 design is being used by players ranging from Scott Henderson to Mike Landau to Reb Beach to Steve Stevens to Kirk Fletcher to Rob Marcello. The OD-100 production languished under CAE during John's years at the Fender Custom Shop and the early years of Suhr Guitars, but John always knew that he'd be getting back into amps. In 2004, Suhr Guitars took over the manufacturing and distribution of the OD-100 and the amp immediately became a big hit amongst the tone aficionados who had heard of or about this legendary amp but never actually heard one in person or played one. All of a sudden, Suhr Guitars had become a serious player in the crowded high-end "boutique" amp market. There are four versions of the OD-100: Standard, SE, Classic, and the 50, each with a distinctive character to suit particular musical situations. From the most gorgeous vintage American clean sounds with a beautiful sparkling high-end and a big punchy low-end, to warm growling overdrive sounds that are organic and sweet, to singing and silky lead sounds that cut through a dense mix, to brutal and intense modern distortion sounds that pulverize with a chest-thumping low-end and shred with cutting yet toneful high-mids and smooth treble that never gets ice-picky in your ears, our OD-100 can cover all the bases and then some! Suhr Guitars is just getting started on a whole new line of Suhr-branded amps and we will extend the tonal foundation that has been laid down by the OD-100 in the years ahead. As is with our guitars and pickups, the future of tone is with Suhr Amps. You can look forward to many new Suhr amp models to suit every musical style coming out for many years to come. We look forward to providing you, the serious player and tone freak, new amps that will inspire you to creative heights that you've only imagined but never achieved. Now plug in and play!